Polotsk (Polatsk, Belarusian: По́лацк, Russian: По́лоцк, Polish: Połock) is a historical city in Belarus, situated on the Dvina River. It is the center of the Polatsk Rayon in Vitsebsk Voblasts. Its population is more than 80,000 people. It is served by Polotsk Airport and during the Cold War was home to Borovitsy air base. The Old East Slavic name, Polotesk, is derived from the Polota River (the real meaning of the name is Puolauta and this in the Lithuanian language means 'falling into', i.e., the river which flows into a bigger river), that flows into the Western Dvina nearby. The Vikings rendered that name as Palteskja. Polotsk is one of the most ancient cities of the Eastern Slavs. The Primary Chronicle listed Polotsk in 862 (as Полотескъ, /poloteskŭ/), together with Murom and Beloozero. However there is debate about this, as some historians believe Polotsk was not yet in existence in the 9th century, and this record was an invention of the compiler. However, an archaeological expedition from the Institute of History of the National Academy of Sciences of Belarus suggests that Polotsk did exist in the first half of the 9th century. The Norse sagas describe the city as the most heavily fortified in all of Rus. Between the 10th and 12th centuries, the Principality of Polotsk emerged as the dominant center of power in what is now Belarusian territory, with a lesser role played by the Principality of Turov to the south. It repeatedly asserted its sovereignty in relation to other centers of Kievan Rus', becoming a political capital, the episcopal see and the controller of vassal territories among Balts in the west. Its most powerful ruler was Prince Vseslav Bryachislavich, who reigned from 1044 to 1101. A 12th-century inscription commissioned by Vseslav's son Boris may still be seen on a huge boulder installed near the St. Sophia Cathedral. For a full list of the Polotsk rulers, please see the list of Belarusian rulers. In 1240, Polotsk became a vassal of Lithuanian princes. Grand Duke of Lithuania Vytenis annexed the city by military force in 1307, completing the process which Lithuanian princes had begun in the 1250s. Polotsk received a charter of autonomy guaranteeing that the grand dukes ′will not introduce new, nor destroy the old′. 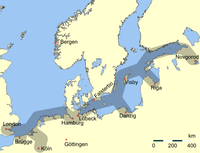 It was the earliest to be so incorporated into the Grand Duchy of Lithuania. By doing so, the Lithuanians manage to firmly grasp the Dvina trade route into their hands, securing an important element for the surrounding economies. The Magdeburg law was adopted in 1498. Polotsk was a capital of the Połock Voivodship of the Polish-Lithuanian Commonwealth until 1772. Captured by the Russian army of Ivan the Terrible in 1563, it was returned to the Grand Duchy of Lithuania just 15 years later. That period of warfare started the gradual decline of the city. After the first partition of Poland, Polotsk was reduced to the status of a small provincial town of the Russian Empire. During the French invasion of Russia in 1812, it was the site of two battles, the First Battle of Polotsk and the Second Battle of Polotsk. The city's Cathedral of Saint Sophia (1044–1066) was a symbol of the independent-mindedness of Polotsk, rivaling churches of the same name in Novgorod and Kiev. The name referred to the original Hagia Sophia in Constantinople and thus to claims of imperial prestige, authority and sovereignty. The cathedral had been ruined by the troops of Peter I of Russia. Hence the present baroque building by Johann Christoph Glaubitz dates from the mid-18th century. Some genuine 12th-century architecture (notably Transfiguration Church) survives in Saint Euphrosyne Monastery, which also features a neo-Byzantine cathedral, designed and built in 1893—1899 by Vladimir Korshikov. The city has produced players for the Belarusian national bandy team. This page uses content from the English language Wikipedia. The original content was at Polotsk. The list of authors can be seen in the page history. As with this Familypedia wiki, the content of Wikipedia is available under the Creative Commons License.